VOL. I NO. 41 REG NO. L5015 DELHI, THURSDAY JUNE 24, 1943. WE’VE SEEN EVERYTHING While T/5 Arthur B. Scott plays his unique "violiphone," Pvt. Les Litant, Sgt. John L. Hottel and Pvt. Billy Gilkey feign pain at the notes flowing from the gadget. But they're only kidding. The music goes down and around and it comes out here. That's Roundup's only lucid conclusion after listening to T/5 Arthur B. Scott's detailed description of the mysterious workings of his unique musical instrument, the "violiphone." It is, he explains, a Japanese instrument, made in Germany, distributed by an English house, sold through an Indian music shop to him, an American, for Rs. 225. Scott, who studied violin for concert work for 10 years (he's a pupil of the famous Mark Wollner), swears that the "violiphone," possibly the most rare of all musical instruments, is not a toy. In this, he has the collaboration of his barracks mates, who have listened to him play everything from classics such as Liszi's Hungarian Rhapsody to the folksey Carry Me Back to Old Virginia. When Roundup picture-grabber Eddie Jankowski insisted upon the photo which appears above, Scott was scandalized, but finally succumbed to his entreaties. "I've spent thousands of baksheesh for music lessons and practiced seven and eight hours a day," he protested. "This is no joking matter." The long, drawling drink of water from Ashville, Nawth Carolina, purchased the instrument to keep up with his studies. "It's not subject to atmospheric conditions like a violin," he explained. "Yet its principle is the same, it has four strings and is bowed. The tone is transmitted through a metal diaphragm, amplified by the trumpet head and the result is a mellow sound a cross between a violin and a trumpet." CHINA - While Chinese ground troops hammered incessantly at t he Jap invader, the 14th U.S. Air Force continued to lend vital help. Most recent communiqué from Lt. Gen. Joseph W. Stilwell's headquarters tells of eight P-40 pilots intercepting a large formation of Jap bombers and fighters southeast of Nanching. Although greatly outnumbered, the American planes destroyed six enemy Zeros and probably destroyed four others. The next day, B-25's, escorted by P-40's, successfully slugged Ouchikou. From both missions, all planes returned safely. Gen. Chiang Kai-shek announced the conferring of the Chinese "Victori Cross" upon two Chinese pilots. One, Capt. Chuang Shihlan, went to the rescue of Lt. Col. John Alison, who was piloting a bomber. He shot down one Zero on Alison's tail and chased off and probably destroyed two more. Latest Chinese ground success has been recapture of four strong points on the Kutu River across the Yangtze River from Shasi. Chinese saboteurs have been active. It has been reported that the bridge spanning the Hwai River at Hwaiho has been blown up. Rumors are floating as freely as clouds in the sky - and some of them are about as substantial - over the name of the United Nations military leader who will be named as head of a new East Asia Command to be set up shortly to prosecute the war against Japan. Nothing elucidating has been added, however, to the original announcement from London's famous No. 10 Downing Street that such a command is to be formed in the near future. Announcement of the new command accompanied release of the surprising news that Field Marshal Sir Archibald Wavell will succeed Lord Linlithgow as Viceroy of India when the latter vacates his office in the autumn and Gen. Sir Claude Auchinleck is now Command-in-Chief in India, succeeding Wavell. Appointments of Wavell and Auchinleck are interpreted to mean that they no longer are to be in charge of active military campaigns and that their talents will be utilized exclusively in the sphere of administration. The British press praised the appointment of Wavell, first military leader to be named Viceroy. The Indian press was less happy. In relinquishing his Army status to become a civilian, Wavell will enjoy the honorary rank of field marshal and the title of baron. Conjecture as to the nationality of the leader of the East India Command is being batted back and forth like a ping-pong ball. Someone characterized by the United Press as a "high United Nations official" is reported to have informed the news syndicate in Washington, D.C., there is a strong move afoot to select a U.S. general, especially as it would be more agreeable to the Chinese. However, possibility of such a choice would seem to be contradicted by the fact that the North African and Southwest Pacific theaters are commanded by U.S. leaders, Gens. Dwight Eisenhower and Douglas MacArthur. Meanwhile, the rumors are floating as freely as clouds. This week's 10th Air Force communiqués numbered three and covered actions undertaken during the period June 15-18. JUNE 15 - B-24's smashed important enemy railroad construction at Thanbyuzayat, south of Moulmein. Four tons of bombs landed in the target area. Other heavies pounded the Jap radio installations on Diamond Island. JUNE 16 - Medium bombers attacked river shipping along the Irrawaddy River in the vicinity of Mandalay. Five large boats were damaged or destroyed and six medium river craft destroyed. Other B-25's struck railroad sidings at Paukkan and barracks at Thazi. Heavy bombers walloped the railroad yards at Mandalay. JUNE 17 - B-24's unleashed 10 tons of bombs on barracks and installations at Lashio, reported "considerable damage." JUNE 18 - Heavy bombers wreaked great havoc with six tons of explosives at the Yamethin railroad yards. Formations of B-25's pounded oil facilities at Yenangyaung. Other mediums attacked railroad installations at Myingan. While on leave from duty as commanding officer of the C.B.I. 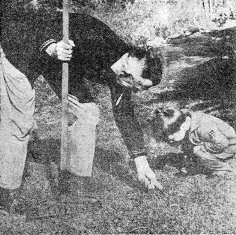 Theater, Lt. Gen. Joseph W. Stilwell puttered around his home in Carmel, Calif., with grandson Johnny. Yes sir, that's India to which he's pointing. It's William Phillips, personal representative of the President to India, who recently reported to Franklin Roosevelt. CHUNGKING - (WD) - As the White House at Washington reiterated the use of poison gas by the enemy would be "reciprocated in kind," a Chinese military spokesman held charges that the Japs dropped gas bombs on Chinese at Paetow in the province of Suicyuan. Jap artillery fired gas shells at Matoushan in southern Shansi and a Jap ship bearing gas containers and 50 tons of gas shells was anchored last month at Woosing off Shanghai. RANDOLPH FIELD, TEX. - T/Sgt. Milton A. Stevens returned home in triumph wearing the D.F.C., Air Medal and Silver Star which he earned as a bombardier in the C.B.I. Theater and North Africa. Stevens group was organized in India during a Jap bombing attack from new men in India and survivors of the Philippines and East Indies campaign. After serving in the C.B.I. Theater, Stevens joined the Allied push in North Africa and made forays over Crete, Tobruk, Tunisia, Sicily and Italy. During the construction of Randolph Field, he worked as a water boy, helping build the post where he was to enlist in 1934. CHEESECAKE GOES WESTERN Cheesecake goes Western this week - with no complaints, we'll wager. Lovely Teddi Sherman's father didn't want his gal to be an actress, but she turned up in Hollywood . . . with a seven-year contract, and his blessings. Roundup sends out a desperate S.O.S. Ever since last week's page 1 yarn announcing that articles rationed in the United States may not be collected if sent home by overseas G.I. 's unless ration stamps are laid on the line, ye ed has been hiding under his desk. Gents, we are NOT responsible. So the British allow a limited quantity of rationed articles to be sent home by overseas troops? So you want to know whether the ruling is retroactive and if that can of coffee already en route will be confiscated? So you believe that the law should be repealed and why doesn't Roundup launch a campaign? What's the reason for the edict? What is the full list of rationed articles? Questions, questions, questions. And you think you have worries. This is a follow-up of Sgt. Jack Blumenfeld's column in last week's Roundup. The sergeant has returned to duty, looking brown as a nut and with his nose as peeled as yours would be after a day at Coney Island. is to place no more restrictions upon you other than those that affect the other guests, and the surrounding community..." This declaration, posted on the bulletin board at a rest camp in the Indian hills, succinctly strikes the spirit which guides its administration. Each khaki-clad lad is allowed to follow his own leisure-time preferences during his stay of approximately two weeks. Sgt. Kenneth E. Jones, of the Third Air Depot Group, for instance, occupied his entire time horseback riding along the narrow and tortuous trails which wind around the steep declivities. Cpl. Francis Reed and Pfc. Larry Hamann, of a Signal Corps service battery, Sgt. Bob Parrish, of a northwestern India seaport base, and Sgt. Harold Shipman, of the Tenth Air Force HQ., daily hiked down to the tennis courts together immediately after breakfast. The boys found that by indulging in this sport they got the best which the camp has to offer - exercise and a healthy tan. Before the tan, unfortunately for some, comes sunburn, as Pvt. Parker Collins can sadly attest. Burnt, after a session in one of nature's solariums on a nearby hill to the point where he resembled a red lobster, he tried a milk bath to alleviate the pain. The condensed milk which he smeared over his body, however, turned sour - as did his friends when they caught a whiff of him. The flies were not as discriminating and feasted frantically at poor Parker's expense and expause. The camp is a photographer's paradise. Everywhere there are G.I. 's mugging for pictures which will have snow-capped mountain peaks or beautiful valleys as backdrops. Here, the G.I. 's, with motion picture, reflex and even box cameras, are obtaining shots of scenes which are strongly reminiscent of the mountain chains back home. G.I. 's energetic enough for a tough 15-mile hike to the river in the valley organized fishing parties. Other G.I. 's went on shorter treks to closer points - but everywhere, both far and near, the scenery is beautiful. Most popular activity at camp is getting in a lick at bunk fatigue. Cpl. 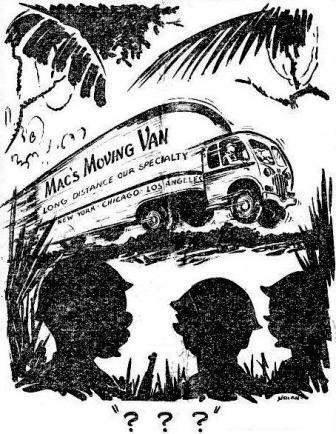 V. Douglas McKibben, of Tenth Air Force HQ., who, sturdy soul, is rarely seen very far from his bunk, was the shining prototype for those who use the rest camp for resting. If a soldier wishes to go to a nearby town, famous as a summer resort, he can get a 48-hour pass. In this city, to keep the boys busy socially, there are nightly dances at the Astoria, and at regular intervals, the Red Cross-WVS dances in the Staff Club. "Of course, I wear no stripes. Would you expect the Assistant Air Vice-Commander to wear stripes? Hmph! Proud G.I. fathers serving in CBI-land may now receive V-Mail photographs of the "bundles of heaven" left by the stork at their doorsteps during their absence from home and hearth in the United States. According to the War Department, transmittal of photographs of children under one year of age or children who were born after their fathers were sent overseas is now authorized. The photograph may include a person holding the child and must appear in the upper left portion of the correspondence space in order to prevent creasing. It may be no more than one-third of the size of the correspondence. ASSAM - It happened the other day in a medical outfit which has been doing routine duty. The Urdu Daily Astonisher had stopped everyone with a startling headline. One man dashed breathlessly into the shower room. "The Japs have bombed our West Coast," he shouted. The recipient of the news, busy lathering his hide, was non-plussed. "Thank God we're safe in India," he replied. - By Lt. J. R. MOBLIN. 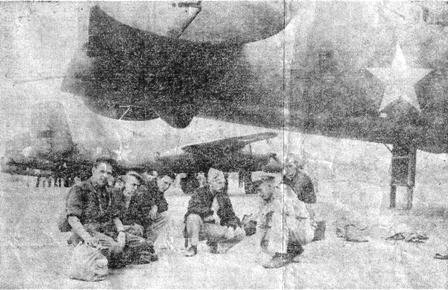 AMERICANS HELP BOMBING VICTIMS The Japs missed their target - a China-based 14th Air Force airfield. But their deadly bomb load landed in a nearby village, causing heavy civilian casualties. So Americans generously contributed to a fund, investigated cases of need among their Chinese friends and distributed sorely-needed money among them. CHINA AIR BASE - Fire and steel belched from the earth. On China's ancient soil there was death and destruction. As the dust settled, smoke reached skyward and the blood of Chinese and Americans alike ran together. Damage to the airfield and installations was negligible, but in missing their target, the enemy had inflicted heavy damage on one of the small villages near the field. In this village lived the coolies who cleaned our offices, worked the runway and rolled the gasoline drums. And too, there lived the little children who shouted "Ding How" and showed thumbs up when American trucks drive by. Merciless bomb fragments killed old and young alike, leaving many families without bread-winners. 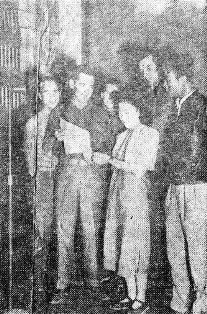 Realizing the plight of these people, men of the 14th U.S. Air Force stationed at this base dug down and made up a fund to relieve the situation that existed in families where relief was urgently needed. Capt. J. E. Tull, chaplain, appointed S/Sgt. William E. Browning, S/Sgt. Henry H. Talmadge and Cpl. Louis E. Hall to work with Lt. Col. Fred Monget in surveying the damage and determining the amounts to be given each family. This detail went into the village, assisted by the Chinese YMCA and Monget's rich experience in handling previous situations, to talk personally with the people, see how much damage had been done to their mud homes and actually see the dead caribou that once provided their living. 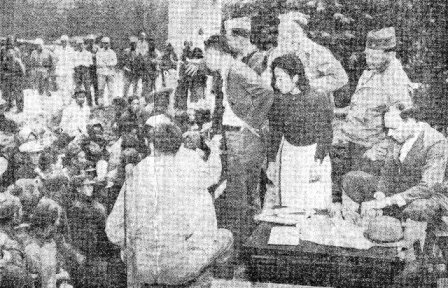 After figures were compiled and recorded, a date was set for distribution of the money, but bombs fell again that day (without damage) so the actual distribution was made on the following day. Angels on High surely must have nodded their approval when the Americans went among the charred ruins to help fellow men in an hour of need. As each name was called and the person came forward to get his envelope, he would fold his hands and bow in the humblest of Chinese custom saying, "She she Ne" (thank you). The scene is a barroom, the year '52. Conversation still dealt with the war we'd been through. Came the voice of a man, in whose hand was a beer. He's well-dressed and handsome, right in his prime. And as he tells his story, you know war is a crime. He'd spent years in India, in Delhi no less. And, believe you him, brother, the place was a mess. He spoke to a small gent, a frail-looking guy. Who was listening quietly, not batting an eye. But let's lend an ear to this very sad tale. Of a man who spent years in that "Wide-open Jail." He's saying, "'Twas horrible! The place has no sense. First you freeze, then you sweat - the heat is intense. Then it's dusty as Hell, and your throat is damned dry. Then the whole place is flooded - there's a hole in the sky. When I say that the rest'rants weren't too clean. Some a year or two back - now don't that leave you cold? That you couldn't dance - your shins would get cracked. Yes, the place was quite crowded, with folks thick as flies. But the trouble was this - more than half were G.I's. Work six days a week, and you would, wouldn't you? Sometimes three weeks - bad for morale, you know." He sighed, wiped his eye, then sipped his beer. And said to his friend, "Now your tale we'll hear." The little guy drank, then spoke quite slow. That was quite a sad story, and with you I do grieve. For where I was, those things just ain't. No time for such things - back on Bataan." 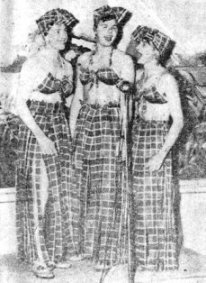 LUSCIOUS LADDIES Entertainment at the opening of an Assam-based Signal Corps unit's dayroom included vocals by the "Andrewopolus Sisters," who mimicked the Andrews Sisters. 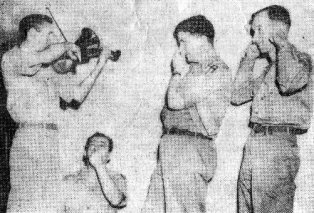 Left to right, S/Sgt. Charles E. Davis, T/Sgt. John E. Cobb and Cpl. John Hupfel. Cute, huh? The battle-lines are drawn in firm array. Now let the drums beat out, the trumpets blare. 'Mid frenzied shouts that fill the smoke-dimmed air. Though one is caught by coattails far from short. Of landing upright, bounces on his head. But still the contest rages, far and near. 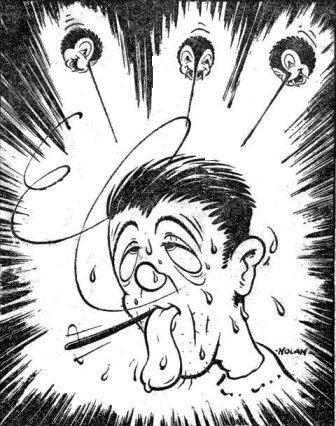 A "zoot heard 'round the world," it would appear. The noisy fray, and wonder if, too late. To save at least, say, Brooklyn from the zoot! G.I.’S GIVEN THE AIR IN CHINA G.I. 's in China recently staged a radio show that was the talk of the town in which they're stationed. Left, Ye Olde Hillbilly Band does some "solid sending": Sgt. 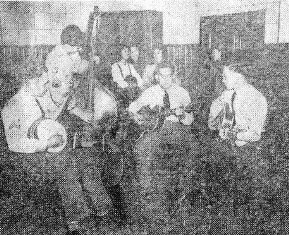 Paul Sereg, banjo; S/Sgt. Vernon Davis, bass; Sgt. John Kwitkowski, guitar; and Sgt. John Pace, guitar. 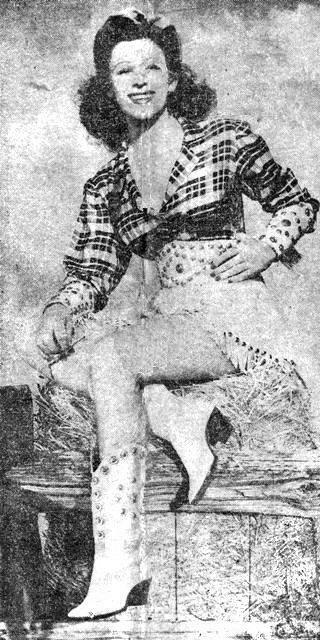 Right, Miss Yu Pei-Tsao, a local belle, is the center of attraction in a romantic skit. Left to right, her admirers are: Sgt. Hank Baynard, Sgt. Addison Bailey, Sgt. Merel Oaks, Cpl. Bob Naves and Mr. Kuan. FLYING CHENNAULTS Meet two of the Flying Chennaults, sons of the 14th Air Force commanding general. 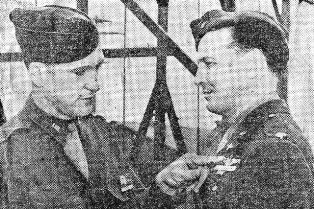 Lt. Col. John, right, who won the DFC in the Aleutians, chats with brother Claire, cadet at a West Coast air base. TIGERTOWN, TRAINING CENTER IN CHINA - So you want to know what we'uns are doing up here? Life in China is somewhat interesting. You can see many strange and interesting things. We are located "out in the country," but we're as happy as can be expected. We have complaints as all do, we more or less let our hair down once in a while, but we let it blow out our barracks bags and usually feel much better. Our living quarters are nothing to be sneezed at. We have a new hostel, which was built especially for us. There are two men to a room, often three, but still it's lots better than some places we've been. Right now we're caught in the rainy season. It's pretty muddy, but we Keep 'Em Rolling. We call this Tigertown because the Flying Tigers of the 14th Air Force roam above us. Their deep growl sounds mighty reassuring. Our PX just isn't, but we get along. Chinese smokes aren't bad when you get used to them. The food could be better at times. We could stand some eatables from Per Diem Hill. Even a can of Spam. Send it along by carrier pigeon. We'll even eat the pigeon. About our work: We teach the ins and outs of Artillery. All in all, there's plenty of work . . . and laughs, too. At the end of each cycle, a big get-together results. The Chinese are happy that we are here to help them, and we're glad to be here to assist in any way we can to help end this war. CHINA-BASED U.S. BOMBING UNIT Members of a China-based 14th Air Force bombing unit swap stories of combat experiences. CHINA-BASED BOMBARDMENT SQUADRON - China . . . Cathay . . . land of age-old fantasy . . . and about seven feet of rainfall. So help me, we float out of bed, scoop the water and polliwogs out of shoes and pants and swim to the mess hall, drink a glass of water and start off to "the line" for another intricate lesson in keeping 'em flying. Let's introduce you to some of your "Sky Dragon" neighbors of the 14th Air Force, whose sting and ingenuity carry destruction and vengeance to the descendants of the Land of the Setting Sun. Above, meet, left to right, S/Sgt. W. J. Holtz, S/Sgt. John Georas, S/Sgt. W. Hopkins, Lt. William M. Henry, T/Sgt. C. H. Patton and Lt. Richard Combs. The ships in the background are battle-scarred veterans of missions to places like Lashio and Canton that won't soon be forgotten. Some ships have returned with 40 to 50 holes. After a tough one, the hatches drop open and the men come out . . . looking as if they've been sorting wildcats for a week, but still grinning as they start checking for cuts, burns and bruises. Overheard in the shower room: "So I took off my knee cap to see if there was any beer in the joint." (Cpl. Peltier, as he vigorously dried his back) . . . The lone squadron phonograph beating out The Porter and the Upstairs Maid, sans the Crosby touch. When you are brought into an Army hospital running a high temperature, you are greeted with a great deal of solitude. You might, after all, have Black Water Fever, from which few recover but which affords the medicos one of the most highly interesting clinical studies known to medical science. After the hypodermicwalla, however, has run that buttonhook he calls a needle under your quivering flesh and extracted a pint of blood for six slides and the blood bank, you are usually left to bloom unseen, as you probably have old-fashioned malaria. Malaria might create a minor medical flurry in upstate New York, but in India the disease is as dull to the practitioner as the common cold. The patient, however, reaps a certain thrill from the diagnosis and prepares to melt into his mattress for 21 days of constant sympathy, affectionate attention from the Army Nurse Corps, hourly visits from his doctor, bon bons sent in by considerate friends and, in general, just have one Hell of a time being the center of attraction. You are given a mouthful of aspirin, and a nurse, as sweet as the memory of Florence Nightingale, gives you an ice bath so refreshing that in your feverish brain you fancy that this, at last, is the second coming of the Divinity. Your fever is broken and the honeymoon ends right there. The next day you awaken and prepare to receive the ministrations of the best "bed-side manners" in the Army. Instead, a bored ward boy walks in, gives you a cold glance and shoves a thermometer into your puss. After the requisite two minutes, he takes a reading which is jotted down in a large book that nobody ever reads. Coyly, then, you ask, "What was it, son?" He gives you that "my God, is this another one?" look and says something about regulations, ask your doctor or something, so, bewildered, you walk from patient to patient asking them to feel your forehead and guess at your temperature. In the meantime, you have been shoved so full of quinine that your head rings like a sea-shell and is just about as empty. You become so deaf that your right arm freezes with the hand cupped to the ear and you automatically say "huh?" every time you hear the slightest sound. As each nurse walks in from shift to shift, you fondly expect a soft hand on the fevered brow, a back rub and 35 minutes in which to tell the story of your life to a sympathetic feminine audience. What you get is an atabrine pill and an admonition that "this ain't a country club." A simple request to continue your regular Wednesday night poker sessions in the hospital is met by the head nurse with remarks about the corner room with the upholstered walls being reserved for you, and the commanding officer sends you a Beano game by way of a first endorsement. We asked for a pass to go to the Saturday night dance and cynical laughter still rings through the sterilized halls of this croakery. After a while, you are allowed to be a big boy and go to the mess hall all by yourself. Having read admonitions on the wall that you must be to meals on time or go to bed without your supper, you charge the place like a wind-broken fire horse. After a week of waiting from 15 to 30 minutes for the groceries, you come in 15 minutes late and are told that everything has been eaten and why'n hell don't you come in on time. If our doctor is reading all this, we're only kidding. The C.B.I. Roundup is a weekly newspaper published by and for the men of the United States Army Forces in China, Burma, and India, from news and pictures supplied by staff members, soldier correspondents, the United Press and Office of War Information. The Roundup is published Thursday of each week and is printed by The Statesman in New Delhi, India. Editorial matter should be sent directly to Lt. Floyd Walter, Rear Echelon Hq., U.S.A.F., C.B.I., New Delhi, and should arrive not later than Monday in order to make that week's issue. Pictures must arrive by Sunday and must be negatives or enlargements. Stories should contain full name and organization of sender.